Ninetales in game: 1,076 Who? Important notice! Pokemon Ninetales is a fictional character of humans. Ninetales (Japanese: キュウコン Kyukon) is a Fire-type Pokémon introduced in Generation I. It evolves from Vulpix when exposed to a Fire Stone. In Alola, Ninetales has a regional variant that is Ice/Fairy. It evolves from Alolan Vulpix when exposed to an Ice Stone. This fox-like, quadruped Pokémon is covered with a thick, luxurious golden-white fur. It has nine, long tails, each tipped with pale orange. There is a fluffy crest atop its head, and a small mane around its neck. Ninetales has gleaming red eyes that are said to give it the ability to control minds. Its ears are pointed, and it has long, slender legs with three-toed paws. 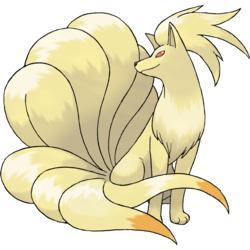 Ninetales is a very vengeful Pokémon that has been known to curse those who mistreat it. This intelligent Pokémon is able to understand human speech easily. It can live for 1,000 years, due to the energy within its nine tails, each of which is said to have a different mystical power. The anime has shown that it can swim. It can be found living in grasslands. The Cinnabar Island Gym Leader, Blaine, used a Ninetales against Ash in their first Gym battle in Riddle Me This. It reappeared in a flashback in Volcanic Panic. In Mewtwo Strikes Back, a Ninetales owned by Neesha was one of the Pokémon that were captured and cloned by Mewtwo. The Ninetales clone is seen again in Mewtwo Returns. In Beauty and the Breeder, a friend of Suzie named Zane used his Ninetales in a Pokémon breeding competition. In Just Waiting On A Friend, a very old Ninetales befriended Brock, who bore a resemblance to her long lost master. This Ninetales composed all sorts of illusions, including one of a woman through which it spoke. A Ninetales appeared in Mystery on a Deserted Island!. 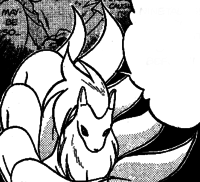 Ninetales was first seen in the universally banned episode EP038. Ninetales made its dub debut in The Battling Eevee Brothers. A Ninetales made a cameo appearance in Misty Meets Her Match. This Ninetales belonged to Rudy. Ninetales also appeared in The Power of One. An injured Ninetales appeared under the care of Katrina in A Bite to Remember. A Ninetales appeared in All Things Bright and Beautifly! under the ownership of a Pokémon Coordinator competing in the Rustboro Contest. Multiple Ninetales appeared in the opening of Destiny Deoxys. A Ninetales belonging to a Coordinator competing in the Hoenn Grand Festival appeared in Deceit and Assist. Ninetales also had a cameo during the opening credits of Lucario and the Mystery of Mew, taking part in the festival honoring Sir Aaron. Also, one appeared in the opening of the movie. A Ninetales appeared in a flashback in Mutiny in the Bounty! as one of J's captured Pokémon. A Ninetales appeared in an image/neon in A Showcase Debut!. A Ninetales appeared in a video in Performing with Fiery Charm!, under the ownership of a Pokémon Performer. EP058 Ninetales Ash's Pokédex Ninetales, the Fox Pokémon. It is the evolved form of the Fire Pokémon Vulpix. EP169 Ninetales Ash's Pokédex Ninetales, the Fox Pokémon. The evolved form of Vulpix. It has nine tails and a shining golden fleece. Ninetales are said to live very long lives. EP232 Ninetales Ash's Pokédex Ninetales, the Fox Pokémon. Ninetales is the evolved form of Vulpix. Each of its tails contains a different mystical power. BW135 Ninetales Ash's Pokédex Ninetales, the Fox Pokémon and the evolved form of Vulpix. With its nine tails and thick golden coat, Ninetales is said to live a thousand years. In A Tale of Ninetales, a Ninetales was captured by Blue, where he uses him in his Gym. A Ninetales was under the control of a Team Rocket Grunt in Piloswine Whine where it attack Gold and Silver but was easily defeated. 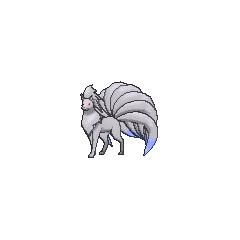 Another Ninetales was one of the Pokémon sent to help the fight in Ilex Forest in The Last Battle XIII. Courtney has a Ninetales that evolved from a Vulpix prior to Adding It Up with Plusle & Minun II. A Ninetales appeared in a flashback as a Pokémon trained by the International Police in Innocent Scientist. In Pokémon Mystery Dungeon: Ginji's Rescue Team, the Curse of Ninetales is the reason why main character Ginji was transformed into a Torchic. Koga sent out Ninetales to participate in the No. 1 Pokémon Contest in Aim to be the No. 1 Pokémon!. Blaine's Ninetales was seen in the Cinnabar Gym when Satoshi enters it. Enta's Vulpix evolved into Ninetales in the final chapter. Pokémon Mystery Dungeon: Ninetales cast a curse on a human that would turn it into a Pokémon, bringing on many natural disasters. The player is blamed for this and travels to the home of Ninetales at the top of Mt. Freeze to learn the truth. Ninetales appears again when Gengar wishes to make right what he did to Gardevoir. He gives Gengar the 9-Tail Crest and sends him and the player to Murky Cave. It is extremely vindictive. It is said to lay a 1,000-year long curse if its tail is pulled as a joke. Legend has it that this mystical Pokémon was formed when nine saints coalesced into one. Said to live for a thousand years, this Pokémon uses its supernatural abilities to manipulate fire. It can burn its prey to a crisp as it pleases. It composes drops of ice in its coat and showers them over its enemies. Anyone who angers it will be frozen stiff in an instant. Possessing a calm demeanor, this Pokémon was revered as a fake incarnate before it was identified as a regional variant of Ninetales. Moves marked with a superscript game abbreviation can only be bred onto Ninetales in that game. 51%-100% HP Feel privileged to see the 1,000-year knowledge of our clan! 26%-50% HP This won't do. I've only half my health remaining. 1%-25% HP My eyes grow dim... Is this how our 1,000-year legacy ends? Level up Rejoice! My level has gone up! While protecting itself with a ghostly ring of fire, it breaths streams of fire to attack. Ninetales came to the Lava Zone in search of fun. Which is just what she found at Absol's Hurdle Bounce! 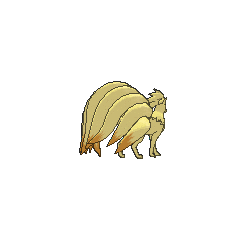 For other sprites and images, please see Ninetales images on the Bulbagarden Archives. No other Pokémon has the same type combination as Alolan Ninetales. Ninetales's name is misspelled as Ninetails in the Pokémon Trading Card Game for the Game Boy Color and in some prerelease material. Ninetales and Vulpix share their category name with Fennekin, Braixen, and Delphox. They are all known as the Fox Pokémon. Ninetales's EV yield of 1 Special Defense and 1 Speed is unique. 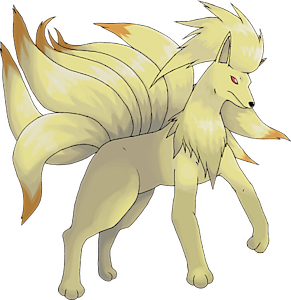 Ninetales is based on a fox, particularly the kitsune of Japanese legend, which have many tails, extremely long lifespans, and can breathe fire. After living a long time, kitsune take on spirit forms, which may explain why Ninetales can learn Ghost-type moves. In particular, Ninetales is based on the 九尾の狐 kyūbi no kitsune, a kitsune of advanced age whose fur has turned silver-gold, and, upon gaining its ninth tail, has gained powers equivalent to a fake, bearing omnipotence, omnipresence, and omniscience. Alolan Ninetales seems to be based on Arctic foxes. Ninetales is a combination of nine and tales, which itself may combine tails and fairy tales, from the Japanese myth it is based on. It may also reference the cat o' nine tailswhip, which was historically used in military punishments. Kyukon is a combination of 九 kyū (nine) and 恨 kon (grudge, from the curse it may cast on its foes), kon kon (the sound foxes make), コンロ konro (gas stove), or ko, an alternate reading of 狐 kitsune (fox). Alternatively, it can be read as 旧恨 kyūkon (old grudge). Cantonese Chinese 九尾 Gáuméih Literally means "Nine tails"
Mandarin Chinese 九尾 Jiǔwěi Literally means "Nine tails"